Gaming journalist Eli Hodapp has co-founded a new startup called GameClub with the intention of preserving old iOS games by updating them. As iOS itself developed over the years, many one-buck games ceased to work and were dropped from the App Store. Now there are swathes of them that simply cannot be played on current iPhones and iPads. GameClub wants to update these classic games to make them available to everyone. "The latest purge of iOS games followed the release of iOS 11, which no longer supported 32-bit apps," Hodapp wrote in GamesIndustry.biz. "We called this the 'appocalypse,' and in the blink of an eye, an unbelievable number of truly classic, critically acclaimed games became unplayable." As well as the move from 32-bit to 64-bit for all apps in the App Store, there have been dozens of other changes to iOS. Hodapp says that some are technical ones such as "operating system compatibility fixes [and] processor architecture changes". Others, though, are cosmetic. "You have to support new screen sizes and resolutions," he explains. "Even great games can vanish from the App Store incredibly quickly if the developer can't make business sense of the annual developer fee," says Hodapp. Hodapp has quit his job as editor-in-chief of the gaming website TouchArcade in order to work on the project. A GameClub spokesman told AppleInsider that the group is self-funding and expects to get the rights to the code, to work on the games, and ultimate republish them. "Individually, these games may not be worth enough to justify keeping alive," says Hodapp, "Taken together, they offer an incredibly deep well of content. A pay model that could leverage those combined strengths could allow those titles to live on." It's not clear yet which games may be saved by GameClub. Even dead and inexpensive games may have complex rights issues to be negotiated, especially if GameClub expects to sell them. It's unlikely, for instance, that a game using intellectual property from Hollywood, or licensed and available on other platforms will be allowed to be updated. AppleInsider has asked GameClub how they plan to compensate the original developers of games but they declined to comment, saying only that more information would be shared publicly soon. Tony Hawk Pro Skater 2 would be nice. I understand the mentality that thinks, “I paid good money for this program so it should keep working forever, no matter what, and it’s Apple’s responsibility to keep it working through every macOS or iOS update” The Apple discussion forums are full of such complaints, especially with the 32/64 bit warning messages popping up now. Same goes for hardware peripherals, namely printers and scanners. Printer manufacturers typically abandon driver development for their printers after a few years. Along comes an operating system update and boom, no worky unless and until the manufacturer updates their drivers. Some do, some don’t, but its’ always Apple that takes the heat from users who simply don’t understand how things work. Back to this article, we appreciate the effort here and hope it bears fruit. The tap tap series was awesome! To see some of them back would be great! For printers people should only buy new printers with AirPrint support built in. Drivers aren’t required so as long as the printer works and connects to the network you should still be able to use it regardless of iOS or macOS version. They’re really expensive new but I got one used for like $35 on eBay. That plus an old AirPort Express and my circa 2005 Brother laser printer with a USB 1.0 only connection is now wireless and AirPrint capable. The printer still works like a champ, using the original toner cartridge it came with. I see no need to upgrade until it dies. This might work for smaller projects owned by solo developers, but I can't imagine any way to convince a large business to drag old code out of mothballs, assign a new development team to it, take the time to re-learn the code and then fix everything. For a non-trivial app, this is going to be a tremendous amount of work, especially when it may require massive re-architecture (e.g. conversion from OpenGL to Metal). But maybe I'm missing something important. I hope I'm wrong and they manage to succeed here. I agree, they were awesome games. Up until the last release, where they jumped head first into the micro-transaction rage. 3 songs on tap tap for $1?? No thanks. Now give me those songs in iTunes AND integrate them into the game, and we can talk. Wouldn't the real answer be to allow developers to charge for updates? As I understand that is a big limitation, you can put out a game but all updates are free. I would have no problem paying for a game or an app v2. update to keep it working. To be honest, I like that when I use Windows I can run older or 32 bit software. I call that a nod to the user. The bottom line as we all know is that Apple gets 30% of the cut of new app purchases so it pays (literally) for them to continually force new versions of everything. If Apple relaxed their app rules, we would have Steam on iOS. That would not only bring back old iOS games, it would vastly increase the number of games available to the platform. Think thousands of classic PC, arcade and console games. Of course that would require Apple to make some concessions to app developers such as lowering the commission rate for in-app purchases and allowing them to execute third party code and that is never going to happen. 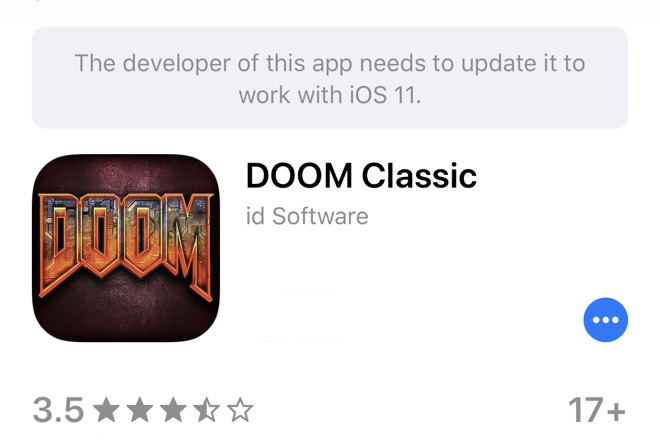 Sad day when id Software fails to update DOOM for iOS. Then again, id Software is just a brand now and doesn’t really exist. Hard to believe the last founder, programmer great John Carmack, left to work for Facebook. I have a shelf full of old MacOS 9 and X games that I can’t run anymore, so I don’t see why iOS should be any different, especially since many of those games cost 50x more that any iOS game ever did. This sounds like a scam. Developers aren’t going to let a 3rd party profit from their IP. The reason Apple discontinues support like this is not for money by forcing you to buy new software. Apple did this before the App Store, or iPhone for that matter, was even a thing. Supporting all these legacy APIs, frameworks and libraries is part of what makes Windows so shoddy. It also eats RAM by forcing all these legacy frameworks and libraries to have to be loaded alongside the modern ones. Plus, it discourages developers from taking advantage of new features on the latest OSes. I think the main idea behind this is really trying to leverage premium vs. freemium, not the history. The weird thing is that the read-between-the-lines interpretation of what they're saying regarding a "deep pool of games" + the name being 'Gameclub' = subscription pricing. It sounds like they are going to take responsibility for updating the apps themselves. Although they are pitching this as them doing something for the public good (saving dead games), it sounds like it's really a business model for getting existing, market proven IP cheap and creating new games to sell. Or am I wrong and I, as someone who bought some of these games years ago, am going to wake up one day and Civ Revolution will just start working again? I doubt it; I expect I'll get the opportunity to spend more money to be able to play these old games.